A few weeks ago after taking some photos of Jupiter, I changed my setup to do some long exposures on an easy target: a globular cluster. Unfortunately I forgot to note down the name of what I had photographed! So a few weeks later when I found the time to process the images I was at a loss to identify what Messier object it was. 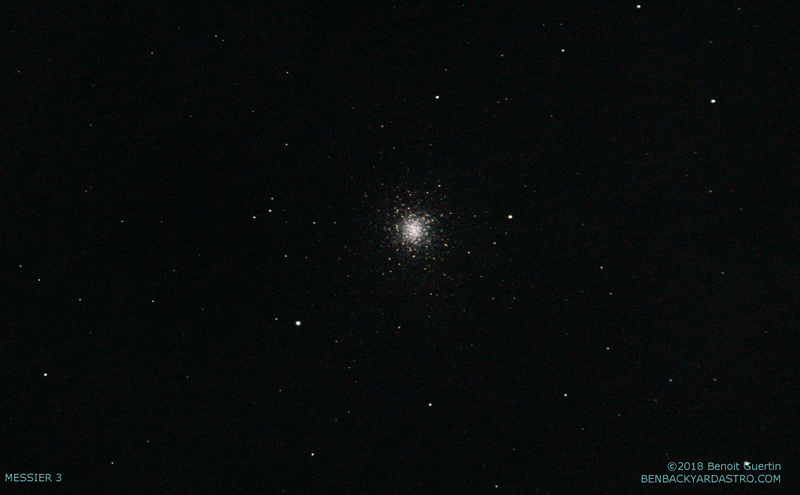 However, after an evening of matching up stars surrounding the cluster and I was able to correctly identify it as Messier 3. The above was taken with my Skywatcher 80ED and Canon 80D. It is a stack of 27 x 10sec exposures at ISO3200 on an unguided and roughly aligned mount. Looking at my archives I found that I had imaged M3 about 10 years ago with the same telescope, so I decided to align both old and new image and see if anything would stand out. And to my surprise, spotted one star that appeared to have shifted. To help identify the star I colorized one of the photos and subtracted from the other (done in GIMP). All the stars within the field of view lined up except this one; the two colored spots are not aligned! To be sure this wasn’t on an error on my part I did a bit of research and found it to be a know high proper-motion star BD+29 34256. It’s not everyday someone with amateur backyard astronomy gear can show how a star has moved in 10 years. This entry was posted in Observing, Photo, Science and tagged Astronomy, Astrophoto, Astrophotography, Globular Cluster, Messier, Stars by Benoit Guertin. Bookmark the permalink.